Built in the area around the train station and then moving north parallel to the train tracks, the earliest residences for Shenzhen cadres were small, danwei compounds. In 1980ish, the Xili Industry and Trade Enterprise bought land rights from Caiwuwei Village and built a small compound along what became Heping Road, just east of the railway. Xili went out of business and Shenzhen Travel took over the compound. However, Shenzhen began privatizing danwei houses in 1988, a full ten years before the rest of the country. Thus, China Travel employees who had housing in the residential area were able to purchase their benefit housing (福利房) at cost. 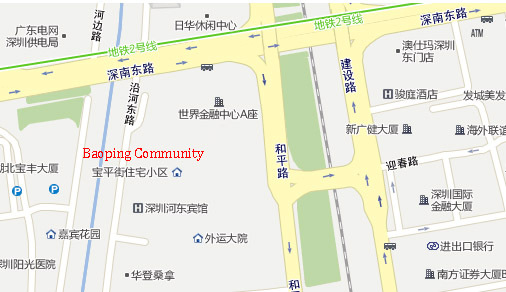 Sometime after privatization, the residential compound was renamed, Baoping. Old and small, the residential compound is no longer upscale housing. Instead, most of the homes are shared rentals (合租), in which each bedroom is rented out and then the kitchen, bathroom, and living spaces are shared. In a shared rental, a family or couple will occupy one room; singles tend to find a roommate or two, depending on their income. Importantly, Baoping is located in the shadow of Diwang and a ten-minute walk to the train station and Dongmen, thus Baoping now provides relatively clean, safe, and convenient low-income housing. But here’s the rub: Baoping is located downtown which means that even cheap housing here is not cheap — 800-1,000 for a 16 square meter room. In a three bedroom apartment, this means landlords (those form danwei employees who bought the homes at cost over twenty years ago) are earning anywhere from 2,400 to 3,000 rmb a month, which is more than the cost per square meter that danwei employees paid for their home. More to the point, 2,400 to 3,000 rmb are the monthly wages of a clerk or skilled worker. It is also possible (and likely) that at some point the danwei employees sold their condo at market price to either another independent landowner or a property management company. An interesting footnote to this story. Rumor has it that the compound was originally designed to include a small park area with a plaza, trees, and benches. The rumor continues that one of the earliest leaders built two, two-story private homes where the park should have been. Today, those buildings have been divided into storefront and dorm rooms, and are managed like legal property. However, the buildings have fuzzy legal status because they aren’t actually registered with the government (没有红本), but they have been used and traded and rented for over thirty years. As former Shenzhen Director of Housing, Sun Liping (孙利平) has argued, Shenzhen’s current lack of affordable housing hasn’t arisen because the Municipality never build subsidized housing. Rather, the first time the Municipality built subsidized housing, government and state-owned enterprise employees benefited. Then, during the housing reform (privatization), they sold those houses on the market. Sun Liping is worried that if the Municipality neither prevents government workers from purchasing subsidized housing nor makes it illegal to privatize subsidized housing, then Shenzhen’s current drive to build affordable housing (保障房) is simply another chance to use public funds for private gain. This entry was posted in noted, photos and tagged caiwuwei, danwei compound, fieldwork, history, housing reform, luohu, real estate, rumors, state owned enterprise, urban village, work unit, 房改. Bookmark the permalink.